Without De Beers and N.W. Ayers advertising agency, would the US diamond market today account for 40% of global demand, with $27 billion in annual revenues, more than three times those of China or India? Quite possibly not. In 1939, De Beers engaged N.W. Ayers to produce an advertising campaign promoting diamonds. N.W. Ayers answered the challenge with a revolution: a long-running campaign that helped create the world’s largest diamond market. Its unforgettable slogan: “A diamond is forever. The campaign ignited popular interest. Long before “viral” became a marketing term, DeBeers’ advertising quickly convinced American men that a diamond was the ultimate love offering and women that no courtship was complete without a diamond engagement ring. Diamonds assumed an exalted place in popular culture, appearing prominently in fiction, movies and songs—no one who has seen Marilyn Monroe sing “Diamonds Are a Girl’s Best Friend” in Gentlemen Prefer Blondes will soon forget the experience. Within three years of the campaign’s debut, demand and prices were on the rise, and by 1960 five in 10 engagements were sealed with a diamond ring. 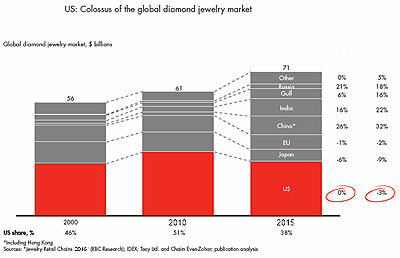 Despite the setbacks of recent years, diamonds remain the cornerstone of the US jewelry market, claiming about 50% of sector revenues. Out of all developed economies, only Japan has a comparable penetration rate, thanks to that country’s extensive borrowings from American culture and De Beers’ strong influence over Japanese consumer preferences. What’s more, diamonds did not lose their appeal to women, and across all age groups and income levels, ownership of multiple diamond pieces is common. Revenues are likely to climb further as the economy and personal incomes rebound, but it will be some time, if ever, before US diamond sales return to the heady growth rates of previous decades.